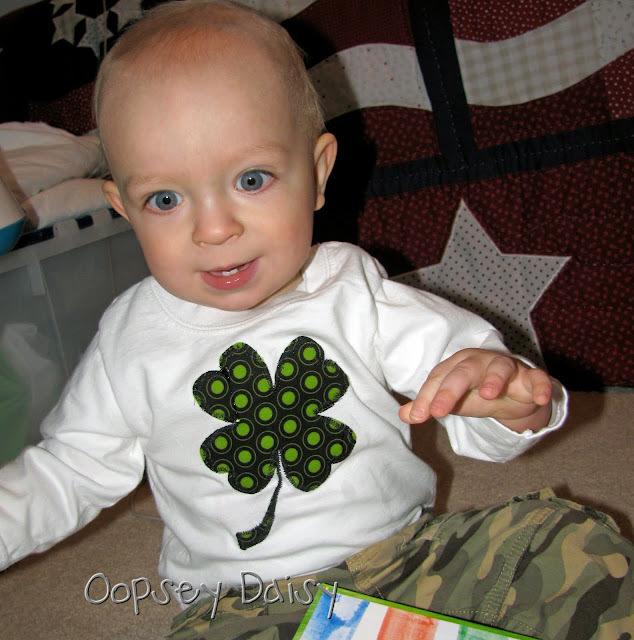 You are here: Home / applique / Cutting Fabric With Your Cricut! That is super cute! 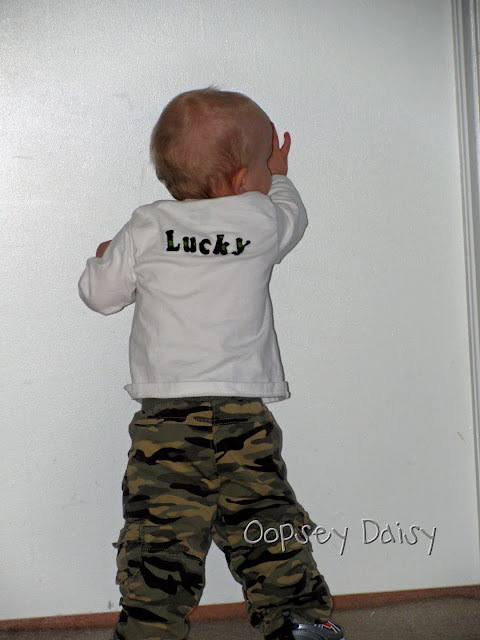 I so badly want a Cricut! Wow, I didn't know you could do that either! Way neat! One day I will get one…. Very cute shirt. He'll be all set for the green dinner! I tried it but I kept the paper backing on from the heat-n-bond so didn't get a clean cut. Have to try it this way… what pressure setting did you use with the blade? I tried it with wonder under… it worked but it stretched out the fabric and didn't work super well. Just FYI. Thanks so much for this tutorial! I am going to have to give it a try! This is great. I have wondered about this for awhile, but never had the guts to try it on my Cricut. My daughter and I are going to have so much fun making some creative things now! Oh I just got a Cricut this week ($84 at Jo Anne's!!) and I can't wait to try this! A great way of combining my two loves… paper crafting and sewing!! oh and nice to meet you too! Oh wow how neat! 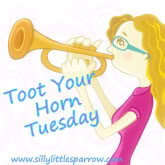 Come share your idea at my party: Thursday's Treasures!! Yay! I've been trying to figure out how to do this forever! just a suggestion, after a while i have found the applique can start to peel of at the edges. I would just do a quick stitch around it just to secure it. You could even do a cute blanket stitch. Kim, I set the pressure on the blade to 5. I have heard cutting it in "portrait" mode may help too, although I didn't try it. I did use the quilters basting spray on my mat just before doing this to give it some extra stickiness just like Carlie suggested. I love that stuff and it HAS saved me from buying extra mats even though mine has taken a beating!! Fox's, you are exactly right about sewing around appliques. I did sew around all of the edges of my applique… I will have to do a better close up on it, perhaps. Carole, you are going to LOVE your cricut. Man, I feel empty if I go a day without using it. Just kidding, but I DO love it. That is awesome! I have a cricut and never use it. I just need to make time to try this out! Great job! Goodness – thank you so much for this. I've tried so many times, but never removed the paper backing, and would always give up! Thank you, thank you, thank you! This is like Christmas in March, girl! Thanks so much! I'm looking forward to trying this out and getting lots of miles out of my cricut. I have been to chicken to try it, but you have given me the encouragement I needed to give it a go. May I ask what cartridge you have that did the shamrock? I have been looking for one but didn't see it. Thanks again for the tutorial ! Ange… I gave up on buying cartridges and bought a computer program instead. It's called Sure Cuts A Lot 2. You can use your own computer fonts and download any image you want for your cricut to cut. I LOVE it!! 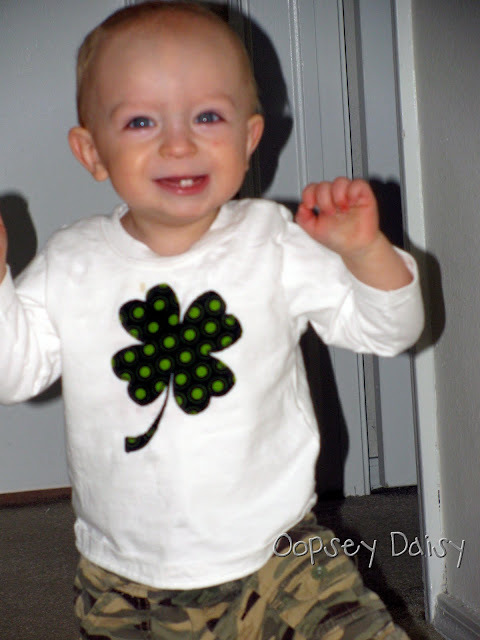 So I just googled shamrock images and downloaded one. I highly recommend this program–no more cartridges! THANK YOU!!! YOU ARE NOT THE LAST TO FIGURE IT OUT!! My whole family of sisters and mom are thrilled with this knowledge. Thanks! Hey! I came over from U Create. Love the shirt! And your little boy is adorable! Love those little teeth! And, don't worry, people constantly think my little girl (dressed in pink flowers) is a boy! I have the smaller Cricut. Think it will work just as well? Which Cricut machine do you use? I have been considering getting one, but I don't know if the inexpensive one from JoAnn's would work as well as a more expensive version. I just got a Cricut and am so excited to find out I can use it cut fabric. Thanks for sharing! So cute! Has anyone tried cutting felt on their Cricut? I just have the regular Cricut, not the Expression. I want to make some cute crowns out of felt for my twins' barnyard birthday party. AllyOOp, I have a Cricut Expressions, and I am by no means an expert on the other machines, so I am not sure about the cheaper version. Let me know though! Katie, if you try out felt, let me know!! Barnyard birthday party?! Cute!! this may have already been said but you don't peel the paper off before you cut. that helps a lot. 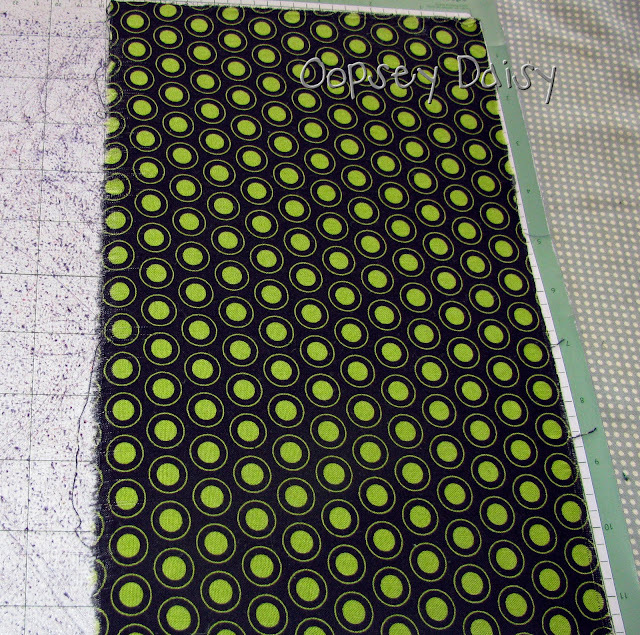 i've cut a TON of fabric…you can use the purple heat n bond so you can sew it, too. you can use the reg. cricut to cut felt. i did that, too. Shut up! No way! I'm super excited and I am not kidding!! This is going to be great! I've been wanting to get a Big Shot because I know they cut fabric, but now I don't have to. Thanks for the tip and of course, it's adorable on your cute little guy. BTW, I have a giveaway going on right now. Come on over and enter! ahh i love it!!! 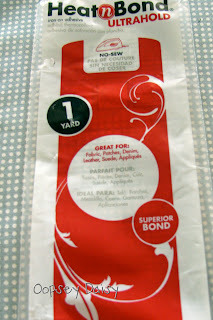 I am so going to cut some fabric this weekend with my cricut!!!! My niece sent me to your blog, and I just tried this! THanks!!!!!!! SOOO CUTE! I have a cricket and have been looking everywhere for how to cut fabric! I'm so excited to try this! thanks for sharing! I have been dying to try this I hadn’t seen it done but we have the paper dolls cartridge and I want to use fabric and not paper. Now I know I can Thank you SO MUCH. I can’t wait to try it out. Hey. 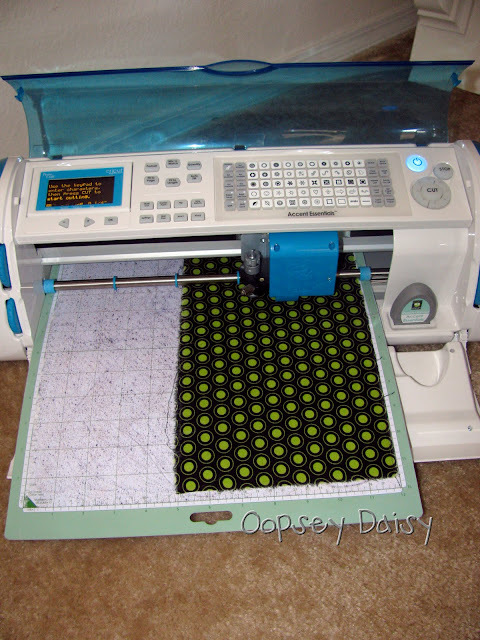 This is how I cut fabric with my cricut machine too. Instead of peeling off the heat n bond paper before cutting, I leave it on. I also use blue painters tape (about one inch wide) to make sure my piece of fabric is completely secure. 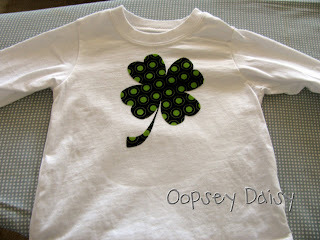 I use a cute zig zag stitch to sew it onto the t-shirts I make. You can cut satin with it too. 🙂 I use it to make those satin flower hairclips. Perfect circles every time. 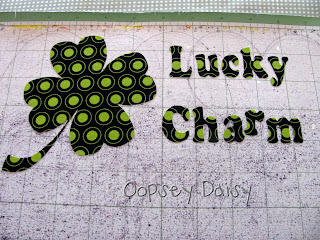 I just laid the fabric right on to the mat, since I wasn’t using it for an applique. I just came across your tute on Pinterest (which I will definitely be repinning)!! I’m totally going to have to try it with my Cricut!! I had my son dressed in all blue with a cute blue blanket and people still said “SHE is so cute” and I would say “thanks but he’s a dude”….for him, I think it’s his eyelashes..but your little boy is adorable!! thanks again for the tutorial! Oh my goodness you are Awesome!!! I was a little skepitcal myself but after the cricut stopped and I too peeled the fabric away…. a miracle!!! This was such a great help and I cant wait to make more crafts using this method. Love your blog!!!! I’ve used this method many times and have loved it. An alternative is Steam-A-Seam instead of the H&B. It gives also cuts great on the Cricut. Hi Nancy! I just used the regular cricut blade housing. I wonder how well it would cut felt. Hey, Alison! I have been wanting a cricut for a long time and was so excited to read your tutorial! Which machine do you have? Do you know if all the machines can cut fabric?